This weekends outfit post was a find from last weeks boot sale and a find from the charity shop. The striped tee is by TU at Sainsburys and was only £2.99 from the Cancer Research charity shop. I liked the colourways, very Autumnal and also the 3/4 length sleeves. I was especially pleased to find this vintage leather skirt last weekend-I actually found two, the other one is a full 50s style, with panels and splits at the hem. Both are so soft and were a fabulous bargain of £6 each. 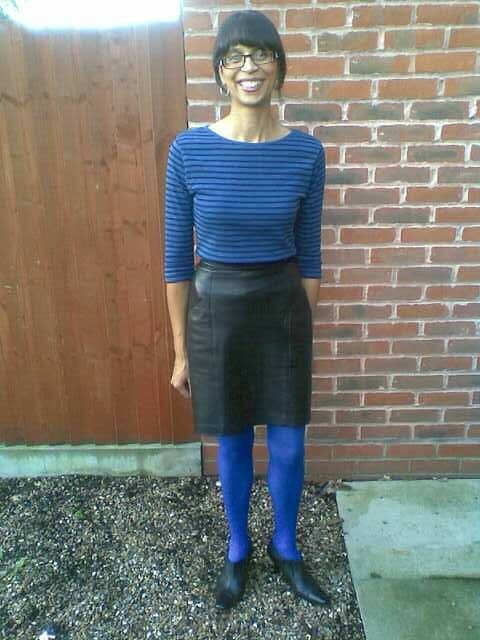 I'm feeling very 80s in this outfit, what with the leather skirt and the electric blue tights, its my decade of choice at the moment!! Hope you are all having a lovely weekend so far!! Very '80s indeed. I'm loving how you've been wearing your hair. Very 80s rock chic! Great tights too. I have a gorg leather skirt I got last year but it appears to have shrunk since then ;-) hoping to fit into it again soo its a look I really love! The cobalt blue tights are fabulous! I love them. Also, that skirt is gorgeous. Fantastic, my dear!!!! ou look so great, inspirational and I'm green of envy about your skirt. Wuhaa, what an amazing skirt! It looks like it was made for you. Love it! Oh what a fabulous skirt! I've been looking for a nice leather skirt in the thrift stores for a loooong time now, with no luck. Every one I find is kind of "bleh" or just too shabby looking. Sigh. I'm hoping I'll get lucky in this search soon. great stripy top and leather skirt!